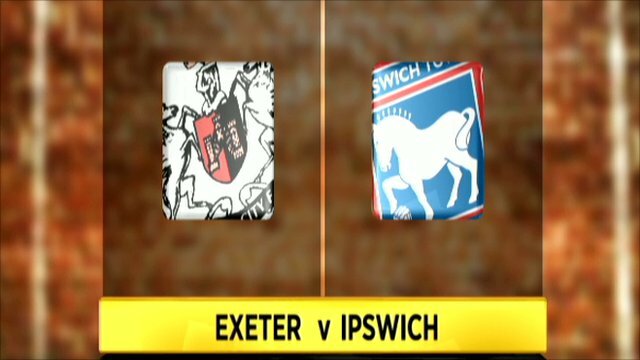 Two David Norris goals, the second in extra time, allowed Ipswich to see off Exeter in the Carling Cup. Ryan Harley's fine shot from a tight angle gave the hosts a brief lead - before Ipswich levelled through substitute Ronan Murray. The Tractor Boys made it 2-1 when Norris beat Paul Jones' near post. Harley forced extra time with an effort from 25 yards, but Ipswich had the final say, Norris following up to score after Jon Stead's shot had been saved. The long trip to the west country proved worthwhile for Ipswich and their supporters, not to mention boss Roy Keane on his 39th birthday. But it was tough work against an Exeter side who may have had a two-goal cushion if Matt Taylor had kept an early header under the crossbar. "It was a marvellous game of football and I'm delighted with the way we played. "We took a lead, we recovered a lead. We did a lot but win the game. "It was a real shame, but we gave great entertainment, and we're looking a good side"
"Jon Stead did a great job up front and the young boys obviously followed him. "We've got some good young players coming through and they had a good test tonight and came through it. "If they keep performing like that the young lads will certainly be in my plans." 123:01 The match has kicked off. 120:00+0:39 Corner from left by-line taken short right-footed by Grant Leadbitter (Ipswich). 119:20 Defending throw-in by Jaime Peters (Ipswich). 117:02 Goal kick taken long by Brian Murphy (Ipswich). 113:33 Jonathan Stead (Ipswich) caught offside. Indirect free kick taken right-footed by Billy Jones (Exeter) from own half, resulting in open play. 112:51 Foul by Richard Logan (Exeter) on Tom Eastman (Ipswich). Indirect free kick taken right-footed by Brian Murphy (Ipswich) from own half, resulting in open play. 111:56 Foul by Jonathan Stead (Ipswich) on Scott Golbourne (Exeter). Indirect free kick taken right-footed by Paul Jones (Exeter) from own half, resulting in open play. 111:43 Attacking throw-in by Jaime Peters (Ipswich). 110:47 Outswinging corner from left by-line taken left-footed by Scott Golbourne (Exeter) to centre, save (caught) by Brian Murphy (Ipswich). 110:21 Inswinging corner from left by-line taken right-footed by Ryan Harley (Exeter) to short, resulting in open play. 110:12 Attacking throw-in by Scott Golbourne (Exeter). 108:51 Shot by Jonathan Stead (Ipswich) right-footed from right side of penalty area (12 yards), save (caught) by Paul Jones (Exeter). 107:12 Shot by Liam Sercombe (Exeter) right-footed from right channel (18 yards), save (caught) by Brian Murphy (Ipswich). 106:18 Foul by Liam Sercombe (Exeter) on Shane O'Connor (Ipswich). Indirect free kick taken right-footed by Grant Leadbitter (Ipswich) from left wing, resulting in open play. 105:00+0:33 Shot by Daniel Nardiello (Exeter) right-footed from right channel (30 yards), save (caught) by Brian Murphy (Ipswich). 105:00+0:13 Goal kick taken long by Brian Murphy (Ipswich). 103:33 Defending throw-in by Steve Tully (Exeter). 103:07 Goal kick taken long by Brian Murphy (Ipswich). 101:36 Defending throw-in by Billy Jones (Exeter). 99:47 Goal kick taken long by Brian Murphy (Ipswich). 98:23 GOAL - David Norris:Exeter 2 - 3 Ipswich Goal by David Norris (Ipswich) right-footed (low centre of goal) from centre of penalty area (6 yards).Exeter 2-3 Ipswich. 97:28 Scott Golbourne (Exeter) caught offside. Indirect free kick taken right-footed by Brian Murphy (Ipswich) from own half, resulting in open play. 96:36 Indirect free kick taken right-footed by Ryan Harley (Exeter) from right wing, resulting in open play. 96:36 Booking David Norris (Ipswich) booked for unsporting behaviour. 96:36 Foul by David Norris (Ipswich) on James Dunne (Exeter). 95:03 Goal kick taken long by Paul Jones (Exeter). 91:24 Shot by Grant Leadbitter (Ipswich) right-footed from left channel (25 yards), save (caught) by Paul Jones (Exeter). 90:55 Foul by Richard Logan (Exeter) on Colin Healy (Ipswich). Indirect free kick taken right-footed by Brian Murphy (Ipswich) from own half, resulting in open play. 90:00+3:05 Tom Eastman (Ipswich) caught offside. Indirect free kick taken right-footed by Paul Jones (Exeter) from own half, resulting in open play. 90:00+2:17 Inswinging corner from right by-line taken left-footed by Shane O'Connor (Ipswich) to centre, resulting in open play. 90:00+1:07 Inswinging corner from right by-line taken left-footed by Shane O'Connor (Ipswich) to centre, clearance by Matthew Taylor (Exeter). 90:00+0:37 Inswinging corner from left by-line taken right-footed by Grant Leadbitter (Ipswich) to centre, save (punched) by Paul Jones (Exeter). 89:07 Foul by Billy Jones (Exeter) on Ronan Murray (Ipswich). Free kick taken right-footed by Grant Leadbitter (Ipswich) from left channel (18 yards), blocked by Matthew Taylor (Exeter). 88:27 Shot by Daniel Nardiello (Exeter) right-footed from right channel (20 yards), missed right. Goal kick taken long by Brian Murphy (Ipswich). 87:15 Defending throw-in by Jaime Peters (Ipswich). 87:03 Daniel Nardiello (Exeter) caught offside. Indirect free kick taken right-footed by Brian Murphy (Ipswich) from own half, resulting in open play. 86:24 Goal kick taken long by Paul Jones (Exeter). 85:38 Goal kick taken long by Brian Murphy (Ipswich). 83:53 Ryan Harley (Exeter) caught offside. Indirect free kick taken right-footed by Brian Murphy (Ipswich) from own half, resulting in open play. 83:33 Corner from left by-line taken short right-footed by Ryan Harley (Exeter). 82:54 Shot by Grant Leadbitter (Ipswich) right-footed from left channel (20 yards), missed left. Goal kick taken long by Paul Jones (Exeter). 82:09 Marcus Stewart (Exeter) caught offside. Indirect free kick taken right-footed by Brian Murphy (Ipswich) from own half, resulting in open play. 81:37 Corner from left by-line taken short right-footed by Ryan Harley (Exeter). 80:24 GOAL - Ryan Harley:Exeter 2 - 2 Ipswich Goal by Ryan Harley (Exeter) right-footed (top-left of goal) from centre of penalty area (20 yards).Exeter 2-2 Ipswich. 77:26 Substitution Exeter substitution: Richard Duffy replaced by Rob Edwards (tactical). 77:26 Substitution Exeter substitution: John O'Flynn replaced by Richard Logan (tactical). Correction - 77:26 Substitution Exeter substitution: Richard Duffy replaced by Marcus Stewart (tactical). Correction - 77:26 Substitution Exeter substitution: John O'Flynn replaced by Richard Logan (tactical). 76:47 Outswinging corner from right by-line taken right-footed by Billy Jones (Exeter) to short, resulting in ball out of play. Goal kick taken long by Brian Murphy (Ipswich). 75:38 Inswinging corner from left by-line taken right-footed by Grant Leadbitter (Ipswich) to far post, save (caught) by Paul Jones (Exeter). 72:25 GOAL - David Norris:Exeter 1 - 2 Ipswich Goal by David Norris (Ipswich) drilled right-footed (bottom-right of goal) from right side of penalty area (18 yards).Exeter 1-2 Ipswich. 70:56 Indirect free kick taken left-footed by Shane O'Connor (Ipswich) from left channel, resulting in open play. 70:56 Booking Richard Duffy (Exeter) booked for unsporting behaviour. 70:56 Foul by Richard Duffy (Exeter) on Colin Healy (Ipswich). 69:25 Shot by Jonathan Stead (Ipswich) right-footed from left channel (30 yards), missed right. Goal kick taken long by Paul Jones (Exeter). 67:54 Attacking throw-in by Jaime Peters (Ipswich). 66:34 Goal kick taken long by Paul Jones (Exeter). 64:17 Goal kick taken long by Brian Murphy (Ipswich). 63:51 Substitution Exeter substitution: David Noble replaced by James Dunne (tactical). 62:56 Assist (cross) by Shane O'Connor (Ipswich) from right wing. 62:56 GOAL - Ronan Murray:Exeter 1 - 1 Ipswich Headed goal by Ronan Murray (Ipswich) (top-left of goal) from right channel (12 yards).Exeter 1-1 Ipswich. 61:43 Inswinging corner from right by-line taken left-footed by Shane O'Connor (Ipswich) to centre, resulting in open play. 61:43 Substitution Ipswich substitution: Troy Brown replaced by Tommy Smith (tactical). 59:42 Cross/shot by Ronan Murray (Ipswich) left-footed from right channel (18 yards), missed right. Goal kick taken long by Paul Jones (Exeter). 59:13 Inswinging corner from left by-line taken right-footed by Grant Leadbitter (Ipswich) to short, cross by Ronan Murray (Ipswich), clearance by Steve Tully (Exeter). 57:49 Defending throw-in by Scott Golbourne (Exeter). 56:57 Inswinging corner from left by-line taken right-footed by Grant Leadbitter (Ipswich) to centre, save (caught) by Paul Jones (Exeter). 56:10 Outswinging corner from right by-line taken right-footed by Grant Leadbitter (Ipswich) to far post, shot by David Norris (Ipswich) right-footed from centre of penalty area (12 yards), blocked by Billy Jones (Exeter). 55:21 Corner from right by-line taken short right-footed by Shane O'Connor (Ipswich). Shot by Grant Leadbitter (Ipswich) right-footed from centre of penalty area (12 yards), blocked by Billy Jones (Exeter). Correction - 54:27 Goal kick taken long by Paul Jones (Exeter). 54:27 Goal kick taken long by Brian Murphy (Ipswich). 53:37 GOAL - Ryan Harley:Exeter 1 - 0 Ipswich Goal by Ryan Harley (Exeter) right-footed (bottom-right of goal) from left side of penalty area (12 yards).Exeter 1-0 Ipswich. 52:35 Substitution Ipswich substitution: Reggie Lambe replaced by Ronan Murray (tactical). 52:35 Substitution Ipswich substitution: Jack Ainsley replaced by Jaime Peters (tactical). 50:41 Foul by Scott Golbourne (Exeter) on Jack Ainsley (Ipswich). Indirect free kick taken left-footed by Shane O'Connor (Ipswich) from right wing, shot by Grant Leadbitter (Ipswich) right-footed from centre of penalty area (12 yards), blocked by Matthew Taylor (Exeter). 48:59 Foul by Jonathan Stead (Ipswich) on Matthew Taylor (Exeter). Indirect free kick taken right-footed by Matthew Taylor (Exeter) from own half, resulting in open play. 48:30 Goal kick taken long by Brian Murphy (Ipswich). 47:26 Goal kick taken long by Paul Jones (Exeter). 47:05 Defending throw-in by Tom Eastman (Ipswich). 45:00+0:51 Attacking throw-in by Troy Brown (Ipswich). 45:00+0:15 Inswinging corner from left by-line taken right-footed by Grant Leadbitter (Ipswich) to short, resulting in open play. 43:28 Attacking throw-in by Troy Brown (Ipswich). 43:11 Attacking throw-in by Shane O'Connor (Ipswich). 41:56 Defending throw-in by Jack Ainsley (Ipswich). 39:55 Handball by John O'Flynn (Exeter). Indirect free kick taken right-footed by Brian Murphy (Ipswich) from own half, passed. 37:47 Attacking throw-in by Shane O'Connor (Ipswich). 34:40 John O'Flynn (Exeter) caught offside. Indirect free kick taken right-footed by Brian Murphy (Ipswich) from own half, resulting in open play. Defending throw-in by Richard Duffy (Exeter). 33:59 Goal kick taken long by Brian Murphy (Ipswich). 32:01 Foul by Steve Tully (Exeter) on Shane O'Connor (Ipswich). Indirect free kick taken right-footed by Grant Leadbitter (Ipswich) from left wing, resulting in open play. Shot by Colin Healy (Ipswich) right-footed from centre of penalty area (12 yards), over the bar. Goal kick taken long by Paul Jones (Exeter). 31:49 Attacking throw-in by Shane O'Connor (Ipswich). 30:08 Shot by Daniel Nardiello (Exeter) left-footed from right side of penalty area (18 yards), over the bar. Goal kick taken long by Brian Murphy (Ipswich). 29:47 Attacking throw-in by Steve Tully (Exeter). 29:24 Attacking throw-in by Scott Golbourne (Exeter). 27:28 Inswinging corner from left by-line taken right-footed by Ryan Harley (Exeter) to far post, save (caught) by Brian Murphy (Ipswich). 25:50 Attacking throw-in by Reggie Lambe (Ipswich). 24:32 Inswinging corner from left by-line taken right-footed by Ryan Harley (Exeter) to centre, header by Matthew Taylor (Exeter) from centre of penalty area (6 yards), over the bar. Goal kick taken long by Brian Murphy (Ipswich). 24:11 Foul by Troy Brown (Ipswich) on Daniel Nardiello (Exeter). Indirect free kick taken left-footed by Ryan Harley (Exeter) from right channel, passed. 22:38 Attacking throw-in by Troy Brown (Ipswich). 22:00 Foul by Liam Sercombe (Exeter) on Colin Healy (Ipswich). Indirect free kick taken right-footed by Troy Brown (Ipswich) from own half, passed. 20:55 Attacking throw-in by Steve Tully (Exeter). 19:08 Attacking throw-in by Shane O'Connor (Ipswich). 18:37 Foul by Richard Duffy (Exeter) on Shane O'Connor (Ipswich). Indirect free kick taken right-footed by Shane O'Connor (Ipswich) from own half, resulting in open play. 17:37 Foul by Colin Healy (Ipswich) on Liam Sercombe (Exeter). Indirect free kick taken right-footed by Richard Duffy (Exeter) from right wing, resulting in open play. 17:19 Defending throw-in by Shane O'Connor (Ipswich). 16:45 Shot by Reggie Lambe (Ipswich) right-footed from right side of penalty area (12 yards), over the bar. Goal kick taken long by Paul Jones (Exeter). 16:12 Defending throw-in by Jack Ainsley (Ipswich). 15:36 Foul by Colin Healy (Ipswich) on Liam Sercombe (Exeter). Indirect free kick taken right-footed by Richard Duffy (Exeter) from own half, resulting in open play. 15:16 Goal kick taken long by Paul Jones (Exeter). 12:34 Attacking throw-in by Scott Golbourne (Exeter). 10:55 Inswinging corner from left by-line taken right-footed by Grant Leadbitter (Ipswich) to far post, save (caught) by Paul Jones (Exeter). 10:40 Attacking throw-in by Troy Brown (Ipswich). 10:03 Shot by Grant Leadbitter (Ipswich) volleyed left-footed from left channel (18 yards), blocked by Matthew Taylor (Exeter). 9:07 Daniel Nardiello (Exeter) caught offside. Indirect free kick taken right-footed by Brian Murphy (Ipswich) from own half, resulting in open play. 8:42 Defending throw-in by Steve Tully (Exeter). 7:47 Goal kick taken long by Brian Murphy (Ipswich). 7:34 Shot by Steve Tully (Exeter) right-footed from right channel (25 yards), over the bar. 6:21 Shot by Jonathan Stead (Ipswich) right-footed from left side of penalty area (12 yards), missed right. Goal kick taken long by Paul Jones (Exeter). 6:02 Goal kick taken long by Brian Murphy (Ipswich). 5:13 Outswinging corner from right by-line taken right-footed by Ryan Harley (Exeter) to far post, shot by Scott Golbourne (Exeter) volleyed left-footed from left side of six-yard box (6 yards), missed left. 4:49 Attacking throw-in by Scott Golbourne (Exeter). 3:50 Goal kick taken long by Brian Murphy (Ipswich). 3:15 Attacking throw-in by Scott Golbourne (Exeter). 2:33 Defending throw-in by Steve Tully (Exeter). 2:13 Defending throw-in by Shane O'Connor (Ipswich). 1:26 Defending throw-in by Shane O'Connor (Ipswich). 1:14 Attacking throw-in by Shane O'Connor (Ipswich). 0:33 Defending throw-in by Scott Golbourne (Exeter). 0:07 Defending throw-in by Billy Jones (Exeter). The referee blows to start the second half of extra time.